Archadeck of Central SC Brings A Truly Custom Experience to Lake Front Living! View from our completed deck and porch extension on Lake Murray. One of the true joys of living in the Columbia area is the abundance of lakes to enjoy. The Congaree, Broad and Saluda Rivers all converge near the city, along a greenway with walking paths, parks and views of the Columbia skyline. However, Columbia also has several appealing lakes located nearby. These include Lake Murray, Lake Marion and Lake Greenwood. Lake Murray, located in Lexington, is one of the most popular and is less than 15 miles from downtown Columbia making it a desired place for residents to live and play. Archadeck of Central SC frequently services homeowners living on Lake Murray and in the surrounding neighborhoods of this beautiful region. Two of our most recent projects are located on the lake. Though these projects are quite different in design and scale, they are both focused on helping these particular clients make the most out of their time outdoors, the view and enhancing the joys of lakefront living! This project added not only valuable outdoor living space to this Lake Murray home, it also added versatility to the scope of activities these homeowners can now enjoy. We extended the footprint of the existing deck and porch and elaborated through redecking with all new wood materials. This project serves as the perfect example of our ability to build upon what you already have in order to give you the outdoor living space you crave. In many circumstances, Archadeck can often redeck and extend your existing structure(s) instead of tearing out your old deck and/or porch and starting from scratch. If it is structurally sound, we can improve the existing footprint without the hassle of lengthy permitting processes. In most cases, the original structure or “bones” can be used if the underlying footings and joists are in good shape. Archadeck of Central SC just completed adding this big beauty of a deck onto the rear of another Lake Murray home. The deck was built using Trex Select composite decking with a wooden rail and Trex rail cap. Trex Select decking features high-performance shell technology that resists stains, mold and mildew and offers a soft, splinter-free finish that’s comfortable on bare feet. Synthetic materials such as composites like Trex are made of elements that stabilize and protect them from UV damage. These materials have several advantages over most species of wood. A synthetic decking material is much less likely to crack or chip, and there is no evidence that termites will attack it. Another benefit is a synthetic product will never have to be treated or stained — setting the stage for carefree outdoor living. You can see these projects and more inspiring outdoor living space designs capable of turning your lakeside home into a lakeside retreat by visiting our decks photo gallery and our covered porches photo gallery, located on our website. This entry was posted in Custom Outdoor Living Designer & Builder, Decks, Elevated Decks & Screened Porches, Home Improvement & Remodeling, Lakefront and lakeside decks, Lakeside and lakefront porches, Open Porches, Outdoor Living, Quality Redecking and tagged Beautiful decks on Lake Murray in Lexington SC, Lake Murray SC Composite Deck Builders, Lake Murray SC Deck Builder, Lexington deck builder, Lexington porch builder, Lexington SC lakefront outdoor structure designs on September 8, 2016 by archadeckofcentralsc. There are many benefits to adding a covered outdoor living space such as a sunroom, screened porch or covered porch to your home. However the first benefit that comes to mind is probably increased outdoor living enjoyment. Enjoyment IS a major factor when designing a covered outdoor living space, however, the benefits do not end there. In honor of July being observed as National UV Safety Awareness month, Archadeck of Central SC would like to point out the protective benefits of having a covered outdoor structure. Covered spaces are most beneficial serving as a shelter from dangerous UV rays that can lead to skin cancer. Skin cancer is the most common of all cancers. More than 1 million cases of skin cancer are found in the United States each year. Melanoma, the most deadly of skin cancers, only accounts for about 4 percent of all skin cancer cases, however, it causes about 79 percent of skin cancer deaths. According to the American Cancer Society, it is predicted that 1,540 new cases of melanoma of the skin will be diagnosed in South Carolina alone during 2016. Archadeck of Central SC screened porch addition. The need to protect your skin from the sun has become very clear over the years, supported by several studies linking overexposure to the sun with skin cancer. The harmful ultraviolet rays from both the sun (and tanning beds) can cause many other complications besides skin cancer – such as a weakened immune system, age spots, wrinkles and leathery skin. Since most of the melanoma and non­melanoma skin cancer cases are directly related to sun exposure, skin cancer prevention and awareness education could greatly reduce the number of those affected. This includes being cautious and limiting the amount of exposure you get in your uncovered outdoor living space. Archadeck specializes in both covered and uncovered outdoor living space designs. We can address your specific needs and desires in order to determine what type, or combination of, outdoor structure is the right “fit” for your lifestyle. For some homeowners, just having a deck or patio is not enough as their outdoor living space must meet specific needs. These can include sensitivity and concern about UV light, allergies and even SAD (Seasonal Affective Disorder). This custom pergola addition in Central SC offers a shady, protected spot for outdoor living! Our custom covered outdoor living spaces are designed to protect without reducing your connection with nature. From a simple front porch to a complete outdoor entertainment area, our structures will transform your home and the way your live outdoors significantly. If you are ready to enjoy the unbridled benefits of outdoor living while being smart about your family’s exposure to the sun, contact Archadeck of Central SC today at (803) 603 – 2160. You can also email us at centralsc@archadeck.net. This entry was posted in Aluminum and vinyl four season rooms and sunrooms, Aluminum three season rooms and screened porches, Covered Patios, Custom pergola designs, Open Porches, Outdoor Living, Outdoor Rooms, Screened Porches, Sunrooms, Three and Four Season Rooms and tagged Archadeck of Central SC, Archadeck of Central South Carolina, Central SC outdoor rooms, Central SC pergola builder, Central SC porch builder, Columbia SC custom covered outdoor living spaces, Columbia SC four season room builder, Columbia SC screened porches, Columbia SC sun safe outdoor living spaces, Columbia SC Sunroom Builder, National UV Safety Awareness month, the American Cancer Society on July 21, 2016 by archadeckofcentralsc. We are wild about our recent outdoor living combination in Wildewood! It isn’t often that an outdoor living space delivers on all the key elements of what makes outdoor living so enjoyable. Our most recent project in the Wildewood community in East Columbia, SC, contains all the structures homeowners crave when they imagine the outdoor living space of their dreams. Each structure within can be enjoyed singularly, but when combined they create a total outdoor living environment. As discussed in a previous post — “The outdoor living structure combination is a trend with proven staying power here in Central SC”— the draw towards outdoor living space combinations persists because they are multifunctional and versatile. Combining different structures is a clear way to define separate areas within an outdoor living zones as opposed to using one singular space to carry out all your desired functions. 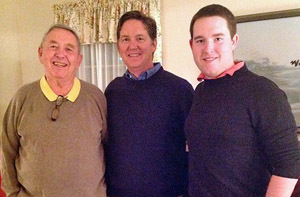 This Wildewood project is the perfect example of putting this concept into action. Covered Porch — Conveniently located just off the rear of the home, and easily accessible to the home’s interior living areas, lies the covered porch addition. The porch features an open and airy open gable design with a rustic exposed rafter ceiling. The porch floor is a continuation of the beautiful AZEK decking used for the deck and features a parting board for added drama and aesthetics. Spacious Deck — Located just off the covered porch is the spacious low-maintenance deck. As mentioned above, the deck features AZEK decking, which is scratch and stain resistant, impervious to insects, mold and mildew and is a breeze to keep clean! Custom built-in bench seating adds valuable seating space and visual interest and helps define the boundaries of the space. 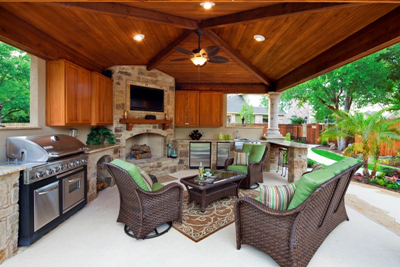 Outdoor Kitchen — The outdoor kitchen and grill area sits conveniently at the end of the deck. It includes a grill, food preparation area and workspace with under cabinet storage. The placement of the kitchen makes entertaining a pleasure as it is easily within reach of the deck, porch and patio areas as well as being a stone’s throw away from the interior kitchen door. Patio and Fire Pit — Located just off the deck, the patio is constructed of stamped concrete and features a stone retaining wall. The retaining wall doubles as a cozy seating wall to enjoy the patio’s integrated fire pit. Form and function creatively mingle as the curves of the fire pit are mimicked throughout the entire design, from the curved stone wall bordering the patio to the curved built-in bench on the deck. Outdoor living combinations such as this project in Wildewood can be used altogether or as separate rooms– each room a vignette of beauty and function. The most wonderful part of our outdoor living combination designs is that two or more outdoor spaces can function as one large design making harmony an important element of the design. or via email at centralsc@archadeck.net. This entry was posted in Custom Outdoor Fire Pits, Custom Outdoor Living Designer & Builder, Decks, Open Porches, Outdoor fireplace and fire pits, Outdoor Kitchens, Outdoor living combination structures, Patio and tagged "The outdoor living structure combination is a trend with proven staying power here in Central SC", Archadeck of Central SC, Archadeck of Central South Carolina, Central SC combination outdoor living spaces, Central SC deck and porch outdoor living combinations, Central SC outdoor living combination builder, Central SC outdoor living combinations, Columbia SC deck and patio combinations, Columbia SC outdoor living, Columbia SC outdoor living combination designs, Columbia SC outdoor living combination structures, Columbia SC Outdoor Living Structure Builder on December 3, 2015 by archadeckofcentralsc. Nothing could be finer than growing up and living in the South. There are things that happen here that most other folks look upon as foreign. Porches are one. In the northern states, sunrooms are more prevalent, and for good reason; sometimes it is just too cold to be outside there. But here, below the Mason Dixon Line, much of the summer is spent on the porch for the practical reason that it is far too hot outside. During the spring, the porch is a welcomed escape from the cabin fever of winter, and during the fall we use it to stretch out as many outdoor living days as possible before Old Man Winter arrives. 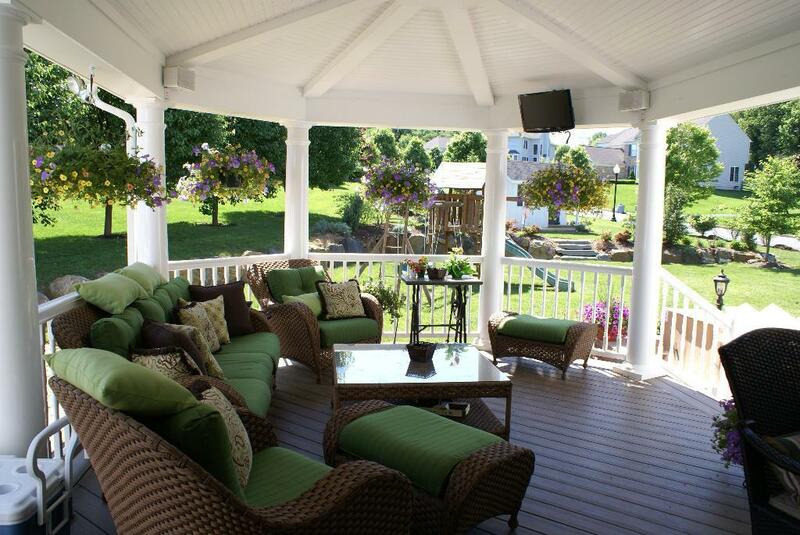 All in all porches are a simple pleasure and a necessity to fulfill the true outdoor living lifestyle. Porches of every size, shape and style — front porches, back porches, screened porches and open porches — all provide the open air, breezy relief from the summer heat while also protecting you from the sun and insects. And although they are all quite nice, a back porch offers the most versatility in function. 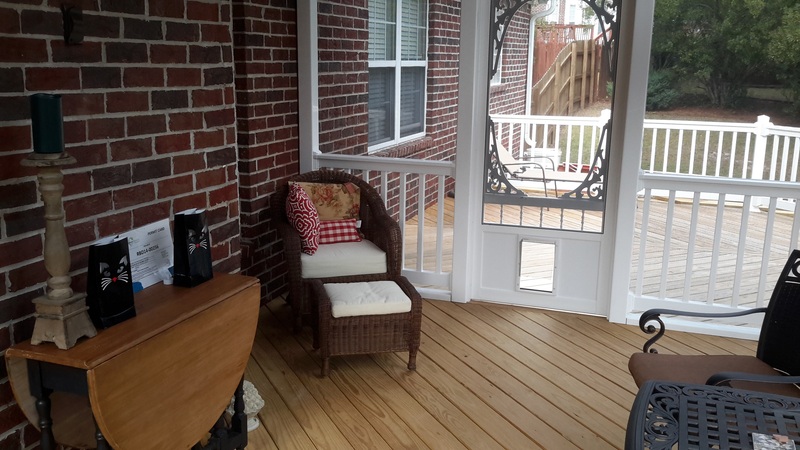 Archadeck of Central South Carolina custom designs and builds porches that can breathe fresh air into your home and connect the outside with the inside. This outdoor living area provides additional living space that gives you a place to relax on nice days and even on the not so nice ones if it is screened in. Your back porch can be a small space that is used for intimate gatherings or barbeques or a large wrap around porch that can accommodate parties and entertaining. No matter the size, be it open or screened, a back porch addition can improve the appearance of your central South Carolina home and increase its property value. The selection of a screened or open porch is one of personal preference. An open porch can serve as an outdoor room with multi-functional versatility. Use it as a place to relax or as an outdoor dining room perfect for dinner parties or family gatherings. Open porches also give homeowners a safe haven to continue enjoying the outdoors even on days when the weather is less favorable because they are protected from the hot sun and unpredictable summer rainstorms. With an open porch you get the benefit of circulating fresh air with the bonus of a roof that provides shelter from the elements. 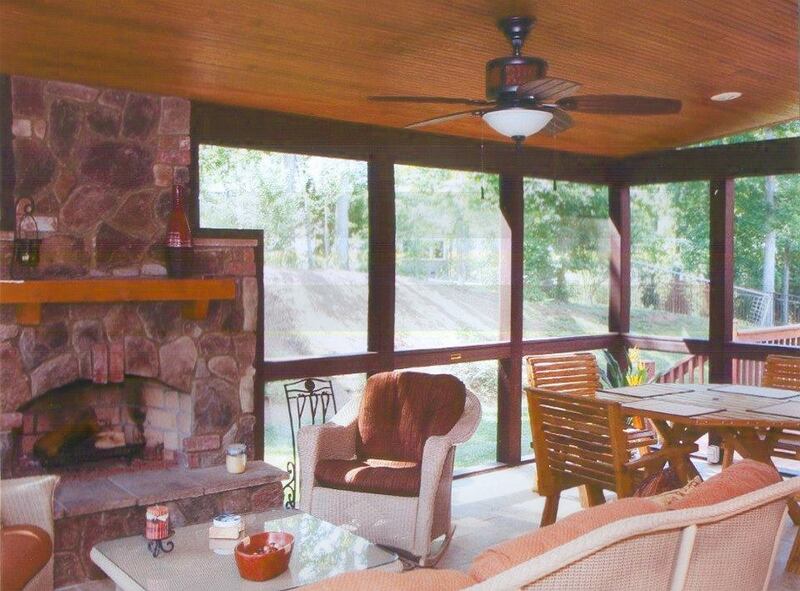 Ceiling fans are a smart addition to an open porch and provide necessary air circulation to keep the temperatures pleasant, especially in our area where temperatures during the summer can soar into the double digits! A screened porch provides the identical benefits of an open porch with additional protection from pesky insects, debris and partial protection from pollen. 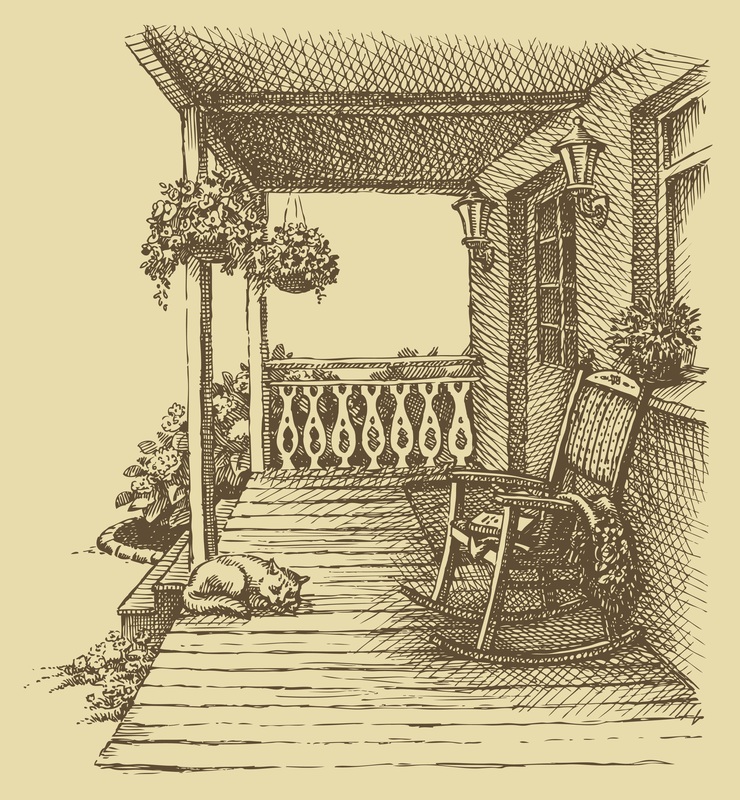 This type of porch is especially important if you have family members with allergies (either to sun, pollen or insects) who still want to enjoy the outdoors. Alone, this type of outdoor living structure is versatile, making it exceptionally popular. When created with multiple zones for relaxing and entertaining, it can be the perfect spot to give you a little more solitude, calm and quiet as opposed to a deck or patio, which are exposed. Additionally this outdoor room, while still letting you feel you are savoring the natural world outside, is just right for accommodating parties and more informal socializing. Pair the screened porch with a deck or patio and you have an outdoor living space combination giving you the best of both worlds with protected areas and open spaces. Giving a face-lift to your home by adding a back porch can help give your family the extra space they need to spread out. As this area’s premiere outdoor living space contractor, we would enjoy the opportunity to work with you to translate your porch visions into a design that will fit the way your family functions. Our commitment to excellence in outdoor structure design and building ensures your unique project will bring enjoyment and pride for many years to come! Call Archadeck of Central South Carolina at (803) 603-2160 today for a free design consultation at or email us at centralsc@archadeck.net. This entry was posted in Aluminum three season rooms and screened porches, Custom Outdoor Living Designer & Builder, Freestanding Porches, Open Porches, Outdoor Living, Porches, Screened Porches and tagged Archadeck of Central SC, Archadeck of Central South Carolina, Central SC porch builder, Central SC porches, Central SC relaxing porch designs, Columbia SC outdoor living, Columbia SC Porch Builder, Columbia SC screened porches, Columbia screened porches and open porches, Making your Columbia SC dream backyard a reality on July 1, 2015 by archadeckofcentralsc. The best place to enjoy the game is in your Central SC outdoor room! The outdoor living room can be one of the most versatile portions of your home. In our area this can be a screened porch, three or four season room, sunroom or even an open porch (in parts of the region where the weather is milder). The flexibility of this type of space is only limited by your imagination. This wonderful addition to your home can become your quiet place to relax, your additional dining area for family events, a meeting room for extracurricular groups, a play room for smaller children or, with the ongoing AFC/NFC football playoffs leading up to the Super Bowl (and don’t forget those USC Gamecocks!) , this room can be THE MAN CAVE! That’s right; you can custom design this room to be that versatile. With a growing demand for outdoor room additions perfect for everyday use and entertaining, we are also seeing an increase in the popularity of outdoor spaces designed with the sports fan in mind. Archadeck of Central South Carolina can design and build your custom outdoor room complete with wall-mounted flat screen TV, wet bar, kitchen and other custom luxuries fit for a king and his family. 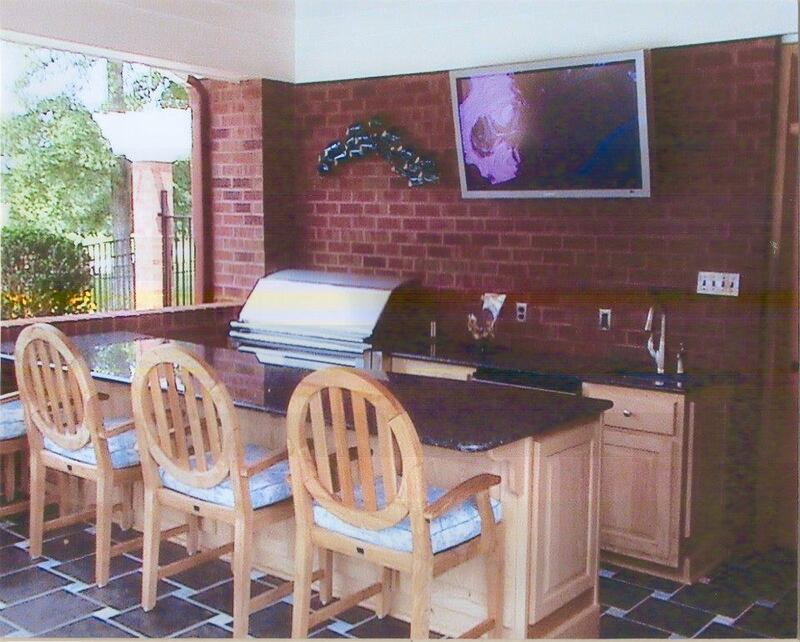 This covered patio space features an outdoor kitchen with bar seating along with a wall-mounted TV — GAME ON! Just imagine it’s time for another of the playoff games…your friends arrive to watch it at your house, because you have the BIG screen TV mounted to the wall of your outdoor living room that has easy access to the deck with your grill/smoker combination and overlooks your spacious backyard. You’ve all got room to spread out and you’ll never hear “can y’all keep the noise down” or “ don’t put your feet on that”…and not just because the game sounds almost live on your surround sound all nestled into your custom built-in cabinets. The fire-roasted aroma of bratwurst, hamburgers and wings cooking just steps away on the outdoor kitchen’s grill signals it’s getting close to halftime. The guys are getting ready to hit the backyard to toss around the ball and see if you can replicate that unbelievable pass the QB made in the second quarter before. Yes…today this is your domain!! The beauty of an outdoor room designed with the accoutrements of the best man cave is it can also be used for all of your entertainment and relaxation needs. Custom fitted with various entertainment features, ample amounts of comfortable seating, a wet bar complete with a sink and insulated bin for ice, maybe even a cozy fireplace all nestled in the private comforts of your own backyard, this outdoor room is destined to be the most utilized space of your home. The best part is your entertaining and relaxing dreams can come true just mere feet away from the great outdoors. It doesn’t get any better than this. Now quit daydreaming and score one for the home team by contacting Archadeck of Central SC to make the outdoor space or room of your dreams a reality! We can plan, design and build the ultimate outdoor man cave the entire family will love and enjoy! Call today for a free design consultation at (803) 603-2160 or email us at centralsc@archadeck.net. This entry was posted in Covered Patios, Custom Outdoor Living Designer & Builder, Entertaining, Open Porches, Outdoor Kitchens, Outdoor Living, Outdoor living combination structures, Outdoor Rooms, Screened Porches, Sunrooms, Three and Four Season Rooms and tagged Archadeck of Central SC, Archadeck of Central South Carolina, Central SC combination outdoor living spaces, Central SC outdoor kitchens, Central SC outdoor rooms, Central SC outdoor rooms for enjoying sports, Central SC screened porches, Columbia SC four season room builder, Columbia SC outdoor kitchens, Columbia SC outdoor man caves, Columbia SC outdoor rooms, Columbia SC screened porches, Creative outdoor living space designs for Columbia SC, Creeative outdoor living designs in Central SC, Lexington SC outdoor kitchens, Lexington SC outdoor rooms, Lexington SC screened porches on January 6, 2015 by archadeckofcentralsc.